Why is it as students get older we believe they no longer need to create and work with their hands? When students are allowed to think, read, and write about abstract concepts, and then represent those concepts in a creative way, their retention and understanding is enhanced.Middle and high school students need opportunities to move around, and work with their hands just as much as younger students. In addition to the intrinsic benefits of students being allowed to manipulate simple building and sculpting materials, employers in all career fields are looking for employees who can think critically and creatively. It is my continuing goal to create opportunities for my high school students to participate in learning tasks that call upon them to think creatively, and to use their hands to help them make sense of the concepts we’re studying. I’ve created two new products for my Teachers Pay Teachers store, Captivate Motivate Educate. The first product is FREE! It gives you a sneak peek into the maker station task cards. Check it out here! If you like these free maker station task cards, you’ll love the #Expansion Pack. In this product you’ll get all the task cards in the free item, but a total of 66 maker station task cards. Students get the chance to explore with LEGOS and modeling clay. They’ll respond to tasks such as, BUILD IT! The main character’s biggest problem. Another task, SCULPT IT! asks the students to sculpt a response to: An unresolved issue. These are challenging tasks that truly asks the students to think creatively and critically about the novel or short story they’re currently studying. 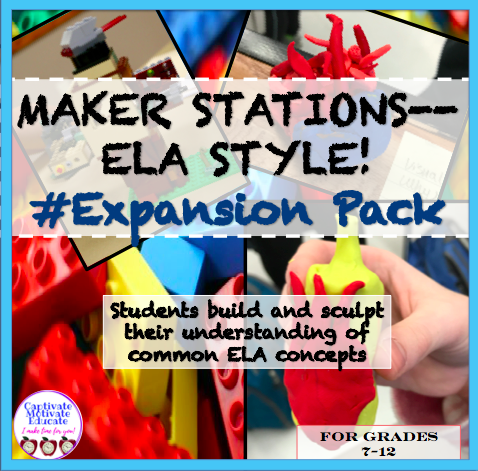 If this sounds like something your ELA students could benefit from, check out Maker Stations–ELA Style! #Expansion Pack! Previous Get ’em up and moving! Next Why Are Idioms so Tough for Students to Understand?